What’s particularly interesting about the regions of Québec maritime is that we can use different ferry routes to go from one to another. I took the ferry between Matane and Baie-Comeau, back and forth, when I went in the Côte-Nord region. First of all, I strongly recommend to book ahead when possible. For my part, it took many worries away! Because passengers must arrive at the terminal an hour prior to departure, I also recommend bringing a good book or a light snack to keep you busy while you wait. I took advantage of that time to stretch my legs and enjoy the scenery. You’ll see that the landscapes are very different at the two terminals! Come boarding time, I was really impressed by the way vehicles are parked on the deck. Smaller cars, like mine, end up on a second level. We get up on it through a hydraulic ramp that’s raised afterwards so that other cars can park underneath. One of the first things I noticed on the ferry: the atmosphere! From what I understood, many passengers are regulars. So, the gatherings in public areas seem like old friends’ reunions. We can hear laughter everywhere on the boat. Several people take advantage of the few hours on the ferry to enjoy a meal or a drink. For my part, I went on the upper deck to admire the view at ease. 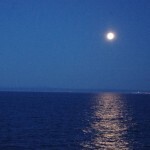 I was lucky enough to enjoy quite a show when darkness came: an almost full moon was reflecting brightly on the dancing waves of the open sea. A piece of advice if you’re prone to seasickness: take an anti-nauseant, have a light snack before boarding and look for a seat at the rear of the ship! Enjoy the crossing!